KELSO, Wash. — Talk about fairy tales, a Kelso, Wash. mom threw a Harry Potter birthday party for her son and it turned into a business. Catherine Jabush created wands for all the young wizards at her son's party and two years later, she's still turning sticks into magical gifts. That's because parents across the country are placing plenty of orders, especially now, for the holidays. “Making and creating is what I love to do. My inspiration is right out the window,” Jabush said, referring to the wooded area outside her home. 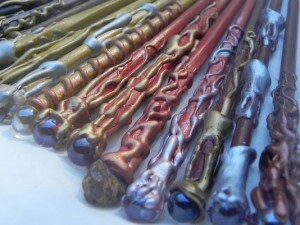 She uses Willow, hickory, oak and drift wood to fashion special wands and sells them online as the Woodland Wandolier. “I might cast a Harry Potter spell and see if I can lift you off the ground,” she said, smiling as she played with one of her creations. In her home studio, where a spider takes up permanent residence and a troll overseas operations, anything seems possible. “The designs are different on every one, depending on my hand movements, my mood, if I'm working slow or fast. And they each have to be different because they're like snowflakes,” she explained. Before the hot glue, there's sanding and trimming and after that, there's the painting and decorating. “There's a lot more love in it and it's going to last longer,” she said. Before each wand is finished there is an 8- to 10-step process and somewhere along the line, Jabush believes that a bit of magic happens, too. “Because of the way they bring people together,” she said. Her customers are not just kids, they are therapists, brides and grooms, or even grown children purchasing magic for their parents. This holiday season, Jabush said her “Frozen” wand has emerged as the best seller. It originated from a special order online. Jabush described herself as a lifelong artist who once created castles out of clay. Now, because of the wands and what they can do for kids, she has found her happy ending.